Michael Caduto's participatory performances engage through the use of creative and theatrical storytelling, music, dance and guided imagery. He has performed at hundreds of venues throughout North American and beyond, including more than 1,000 public and private schools, libraries, museums, nature centers, camps, colleges and other locations. His school programs reach 15,000 children each year and more than 250,000 people have attended his performances and educational programs. Michael has also performed at dozens of national, international and regional conferences, including storytelling and theater festivals, children's festivals, educational conferences, teacher conventions, conferences on cultural diversity and Native North American traditions, writer's workshops, literacy conventions, natural history festivals and conferences, bookseller conventions and more. A small sampling of the venues and audiences for which Michael has performed include the American Museum of Natural History (New York), Royal Museum of Scotland (Edinburgh), National Wildlife Federation Conservation Summits (Burlington, Vermont & St. John, New Brunswick), Wheelright Museum (Santa Fe, New Mexico), California Reading Association (Anaheim), National Association for the Preservation and Perpetuation of Storytelling (NAPPS) Fifth Annual National Storytelling Congress (New London, Connecticut) and the North American Association for Environmental Education's National Conference (Washington, D.C.). This performance uses traditional stories from throughout the world, such as North America, Africa, South & Central America, Europe and Asia. Stories are accompanied by participatory songs, chants, Native instruments and a dance. During this presentation participants share native traditions for wise Earth stewardship. The audience is introduced to the great Circle of Life--the basis for a balanced, sustainable existence with Earth. Song, story and dance from several different cultures are used to present a picture of humankind as a cultural garden--a rich, interesting and exciting variety of peoples. Participants are encouraged to realize the value and importance of approaching cross-cultural relationships with tolerance, understanding and appreciation. Emphasis is placed on the fact that we are all native to some region(s) of the world, and that our roots reach out and mingle in the fertile soil of humanity. Come travel through magical lands as we meet a wizard, wise elders, sinister elves, ogres and animals that can talk in tales of wonder from the Provinces of Italy. 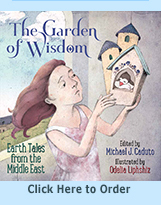 These traditional tales, retold in a new voice, are chosen for the seeds of wisdom they contain--ancient lessons that are especially important in our times. Adventures tell of the value of strong virtues, such as bravery, generosity, faithfulness, courage, belief in the equality of all people and in the power of true love. Come join these stories of great adventures in nature that are sometimes funny, always moving and often end with an unexpected twist of wisdom. This participatory performance shares myths and legends from Africa, South America, Europe and North America--an Abenaki tale with a traveling song. The audience is immersed in the fantastic world of the imagination through a host of humorous voices and characters as well as songs, chants, guitar, native instruments and a dance. This participatory performance shares animal myths and legends from Africa, South America, Europe and North America (an Abenaki tale). It immerses the audience in the fantastic world of animals through songs, chants, guitar, native instruments and a dance. Bring your singing voices and your dancing feet! Come join these tales that are sometimes funny, always moving and often end with an unexpected twist of wisdom. How can a tortoise fly (Tibet)? Which bird has the most beautiful song in the world (Italy)? What is the magic of the Pumpkin Seed Bird (South America)? How did Gluscabi outsmart the magnificent Wind Eagle (North America)? During this entertaining celebration of our beloved feathered friends the ways and wisdom of birds come to life through traditional tales from throughout the world, accompanied by songs, chants, Native instruments and dance. This popular performance uses song, chants, native instruments, dance and stories that are carefully chosen from among the native cultures found throughout North America. Caduto's lively performance engages the audience with a cast of humorous and dramatic characters and voices that share the theme of wise environmental stewardship. During this presentation participants are introduced to, and actively involved in, the great circles of life -- the traditional Native American basis for a balanced, sustainable existence with Earth. This performance uses song, chants, native instruments, dance and stories that are carefully chosen from among the Native cultures found throughout North America to explore the true nature of Thanksgiving. Caduto's lively performance engages the audience with a poignant blend of drama, humor and a traditional chant. During this presentation participants are introduced to the Circles of Giving and Receiving--the traditional Native American basis for living in balance. Native American animal myths and legends come alive in your imagination. This performance uses song, chants, native instruments, dance and stories from Native North America to share important lessons for wise stewardship toward animals. During this presentation participants are introduced to, and actively involved in, the Native American practices for living in reciprocity with the animals--a lasting, sustainable existence with wildlife. Each new Generation has the opportunity to carry on the ancient tradition of growing Native seeds and passing a living legacy on to the next generation. Through story and song this performance explores the connections between people, plants and Native gardens. These gentle, humorous, nurturing stories also lead us on a journey through the cycles of the seasons and the changes that take place around us, and within us. For thousands of years the Abenaki (Alnôbak) have lived in the land we now call Vermont, New Hampshire and the surrounding regions. Their families and communities have sustained themselves in an ever-changing world. During this engaging and entertaining program/performance, author and storyteller Michael Caduto immerses his audience in Abenaki culture. He helps participants to imagine a living past, and present, through storytelling, songs and a dance. The group will explore Abenaki traditions for taking care of the natural world. All participants will be invited to make necklaces as keepsakes and reminders of the traditional ways. In this performance/celebration of freshwater life Michael Caduto immerses his audience in Native stories, songs and chants. He also uses native instruments and invites everyone to join in a dance. Hear how Azeban the raccoon tricks the crayfish (Abenaki--from New Hampshire & Vermont), how Koluscap defeats the Water Monster (Chippewa) and how Tortoise is saved from a great drought by his friends, the Cranes (Tibetan). Come hear how Coyote becomes the moon (Kalispel), how Grandmother Spider steals the Sun (Muskogee/Creek), how Fisher goes to Sky Land and changes into the Big Dipper (Anishinabe/Chippewa) and how Nagah, the mountain goat, becomes the North Star (Paiute). This performance uses songs, chants, native instruments and stories that are carefully chosen from among the native cultures found throughout North America and beyond. Participants are immersed in an experience of the great sky dome that arches overhead. An excellent program for schools and nature centers with access to SkyLab or other planetarium. Come join these stories that are sometimes funny, always moving and often end with an unexpected twist of wisdom. This participatory performance of myths and legends celebrates Native gardens and the harvest. Enter a fantastic world of the imagination through a host of voices and characters as well as songs, chants, guitar, native instruments and a dance. We will close with a group dance and a taste of Native food. Abenaki myths and legends celebrate the native peoples of northern New England and the Maritime Provinces of Quebec. Stories, songs, chants, native instruments and a dance entertain and reveal the rich traditions of such cultures as the Western Abenaki, Penobscot, Passamaquoddy, Micmac and Malecite. This performance is a window to greater understanding of the Wabanaki Nation -- the "People of the Dawn" -- both past and present. In this celebration of the Haudenosaunee, "People of the Longhouse," participants are immersed in Iroquois culture through stories, songs, chants, native instruments and a snake dance. As the audience enters the rich world of Haudenosaunee oral tradition they meet the first healers, encounter turtle tricksters and discover the origins of bird songs. This performance is a window to greater understanding of the Six Nations of the Haudenosaunee, both past and present. North America's original story books were the stones themselves. During this participatory performance myths and legends from the Abenaki peoples of New Hampshire and from other Native American cultures. Enter a fantastic world of stories in which stones speak, people are created from the mountains and The Great Stone shares the first stories ever told. Find out how Earth's geology is revealed by the scales on Turtles back. Come join in these stories, songs, chants and a dance, accompanied by guitar and native instruments. Bring your singing voices, your dancing feet and your imaginations! This is a celebration of Native American culture through stories, song, and dance. Hear how Grandmother Spider steals the Sun, how Turtle flies south for the winter, how Earth is created on Turtle's back, and how a boastful bear is outwitted. Come meet a cast of humorous characters and dramatic voices as you're immersed in an experience of traditional stories. Participants will sing along to the accompaniment of guitar and drum and dance to the rhythm of rattles. In addition to being an engaging experience, this performance is a window to greater understanding of the Native cultures of "Turtle Continent." This edgy performance of myths and legends for the Halloween season brings the world of night to life with a varied cast of humorous and dramatic characters and voices. This performance of Native stories, songs and chants transports the audience to dark places where bats flutter, animals create havoc and a monster chases a hunter and his dogs through the woodland shadows by moonlight. The chills end with a dramatic Halloween telling of "Mean John and the Devil"--a dark Irish tale about the first "Jack-o' lantern." Rated SC for Scary . Traditional tales about our favorite animals come to life in the world of the imagination through a host of humorous and dramatic characters and voices. These engaging myths and legends about dogs and cats, both wild and tame, are accompanied by songs, chants and native instruments. Come hear a Polish tale about how cats caused all of the the animals to lose their freedom. Experience the drama and suspense of a Mohawk story in which a hunter's dogs save him from a powerful creature of the dark woods. Find out what happens when Coyote angers Grandfather Rock (Pawnee). We'll even share a Mayan tail about how dogs got their tales. This is an exciting hour of immersion into the realm of play in the Native American tradition. The opening performance draws from such Native stories as "Turtle Races with Bear" (Seneca), "The Great Lacrosse Game" (Menominee) and "Gluscabe and Dzidziz" (Abenaki). We'll chant to the stories, sing along to the music and move together in a round dance. Then everyone will have fun playing a variety of Native North American games, including hoops, rings, rabbit sticks, foot races and cat's cradle. This participatory program for children and families explores the importance of games when growing up and how games help to keep us fit and sharpen our minds throughout our lives. Best suited for families and children ages 5 to 11. Stories of adventure, dark journeys and off-beat humor add intrigue to any campfire experience. As the flickering flames dance on the faces of listeners, tales come alive in their imaginations. Indigenous tales are most at home around the flames where they were first told. This rich performance of campfire stories and music ends with a group circle dance under dark skies. Don't be surprised if a tale leaps out and causes your hair to stand on end! Just for the pun of it! This introduction was written and read by Bina Williams, Children's Librarian at the Bridgeport Public Library, Connecticut, April 15, 1999. His name is Caduto, first name Michael. He's a regular Renaissance feller. To tell us tales that delight and haunt. In stories we wish would never end. Abound in his book Keepers of the Earth. join along with Keepers of the Night. Celebrate courage and a sense of self. Clap so they can hear you on the planet Pluto!